Well guys, it is unbelievable. 10 weeks until we get to meet our son. My doctor even told me that around 36 weeks is when they start to expect that the baby could be born. So technically, we COULD possibly have a child in just 6 weeks!! I'm so excited I can't even explain to you! And according to the book that I am reading given to me by my doctor, weeks 29-32 are the 8th month of pregnancy! That means I am already 7 months pregnant?!! It doesn't seem real. For as big as my belly is, I still feel pretty small for being 7 months pregnant. I mean, I thought by now I would be waddling everywhere and having a hard time sitting and standing back up. But I feel great! I feel like I could run a marathon. Obviously I couldn't, I would probably get out of breath by about the 10th step,.... but I FEEL like I could! That is what matters, right? 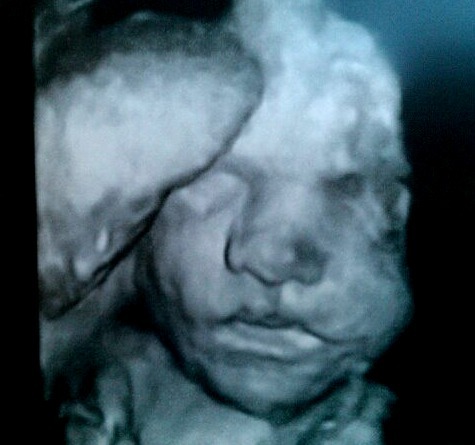 We went and had a sonogram at the beginning of this month. In case you missed it, here is a picture of our sweet boy's face. I can't wait to kiss all over it. And for those of you who have called me lately to catch up on how the pregnancy is going, I've got good news... Turns out - I'm NOT a sweller after all! Whew! Not yet anyways. One night I freaked out a little because my feet, ankles, ( well, who am I kidding, my Cankles), fingers and even a little of my face were all swelling up. I thought that maybe I was going to be a Sweller! And 7 months in. Eww. I started worrying about Preeclampsia and all of that good stuff, but it turns out, I haven't swollen since! It just so happens that I was very dehydrated that day and had Chinese food for lunch. Surprised? ;) The Chinese has LOTS of sodium in it. Thus, causing me to swell like a crazy woman! I made sure to check my blood pressure the next time I went in to see if it was really high, and the nurse joked that she wasn't sure if I was alive because it is so low. 90 over 60. Works for me! Our Young Families at our church congregation started a new class about parenting on Sunday mornings and it is amazing. So far we are talking about the marriage relationship and the bond between you and your spouse, because without that bond in place, you won't be as successful as a parent. We are really enjoying it a lot, and even though we have lots of homework to do each week for it, it is well worth it and will only strengthen the love that we already have between us. I have a baby shower being thrown by the ladies at our congregation this Sunday after services. I am really excited about it, not only because it will be my very first baby shower, but because all of these ladies are so sweet and supportive of me. I know they love Connor already. I also have Relay For Life Leadership Summit in Dallas next week for work, which is always a blast! And we are having maternity pictures taken the first week in October which should be fun and really special. I kid you not, we had this conversation in our living room one night this week. Verbatim. Me: You know, Ad, when we have this baby life isn't going to be as easy as it used to be. Everything is going to be a little more work. Like now, when we go somewhere, we just hop in the car and go. Then we come home, hop out of the car and plop on the couch. But when Connor gets here, we will have to pack things up. Put the car seat in the car. Strap the baby in the car seat. Get to where we are going. Get the baby out. Put the baby in the stroller. Put the baby back in the car seat. Come home. Take the baby back out of the car seat. Unpack everything. You know, it's just going to be a lot of work having a baby and I want you to be prepared. Adam: It was your idea.